One of the most common concerns among social care workers, at least those I meet is around diagnosis. There are so very many different psychiatric diagnoses, all with their own particular symptoms and they seem almost impossible to remember. I can sympathise with that view – there really are a lot of diagnoses and the differences between them sometimes seem so very subtle that it’s hardly worth mentioning at all. However – that doesn’t need to be such a problem in social care. Support workers aren’t diagnosticians and they don’t need to be able to fit everyone they work with into the particular boxes of psychiatric diagnosis. It’s enough to know what the service-user’s actual problems are without worrying about pigeon holing them. After all – there really is much more to life than diagnosis. So here’s a breakdown of what really matters in psychiatric diagnosis. Diagnosis means ‘through knowledge’ and yet we know much less than we’d like to for sure. In fact there are those who argue that diagnosis is little better than useless in mental health care and should be replaced by a different system known as ‘formulation’ instead. This is because whereas diagnosis seeks to place sufferers and their conditions into predefined ‘boxes’, formulation seeks to construct a new explanation for each individual regardless of the experiences of other people and the ‘boxes’ they may have occupied in the past. In the case of diseases like Alzheimer’s dementia or Parkinson’s disease diagnosis can (to a greater or lesser extent) fulfil both of these promises. In the case of ‘Schizophrenia’ or ‘Brief Psychotic Episode’ it seems far less effective and in the opinion of many far less plausible too. It’s important to be clear about what this means in practice. 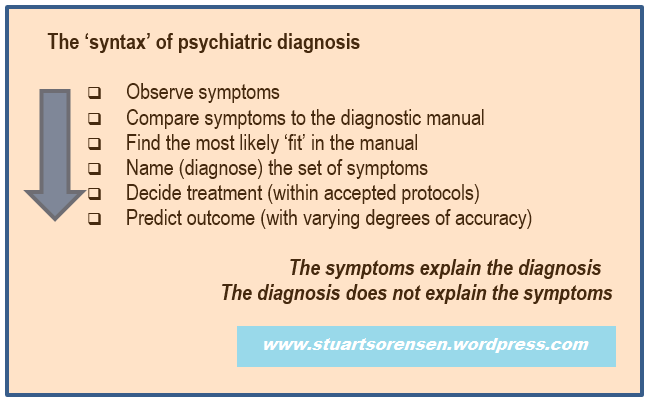 There’s a set order (a syntax) to psychiatric diagnosis and it really only works in one direction. This is different from many other sorts of diagnosis, the diagnosis of physical illness for example. That’s because whereas physical illnesses tend to be diagnosed ‘through knowledge’ of measurable physical processes with very specific, known (or at least likely) and predictable specific effects, psychiatric diagnoses tend to be based upon ‘clinical judgement’ with little or no physical tests available to support them. We can say this because we have excellent evidence of impaired lung function and because we know what happens to respiration when people with COPD exert themselves. We have good, testable information about the causes ranging from oxygen saturation levels in the blood to peak flow measurements of respiration itself to name but two. We know exactly what we’re looking at in other words. Psychiatric diagnosis is different. It isn’t usually based upon blood tests or sophisticated scans. Instead the psychiatrist takes a history, observes the current ‘presentation’ of the patient and then makes a diagnosis based upon how closely the person’s ‘symptoms’ match the descriptions in the psychiatric diagnostic manual. Not everyone diagnosed with schizophrenia has visions. So the symptoms might explain the diagnosis but the diagnosis can’t explain the symptoms. It’s just a name, a label and names don’t explain things – they simply classify them. For example, on my office wall I have a large clock. I know it is a clock because it has the observable characteristics of a clock (hands that rotate, a numbered face and it ticks). However naming it as a ‘clock’ doesn’t tell me anything about how it works. I am no closer to understanding the intricate mechanisms of the various cogs and springs inside the clock just because I know what to call it. Many psychiatric diagnoses are just like that. We don’t get any closer to understanding the workings of schizophrenia just because we can name it. That’s why we must be careful to let symptoms explain the diagnosis but not to delude ourselves into thinking that the diagnosis explains the symptom. Generally speaking we can only go one way with psychiatric diagnosis. It doesn’t usually work well ‘in reverse’. But diagnosis isn’t entirely useless. My own view is that it is too reductionist. Diagnostic psychiatry reduces people to component parts to be ‘fixed’ rather like a mechanic working on an engine. Diagnosis has its place although, like many other people working in mental health services, I’d welcome a more widespread use of psychological formulation alongside the ‘boxes’ of traditional psychiatric practice. 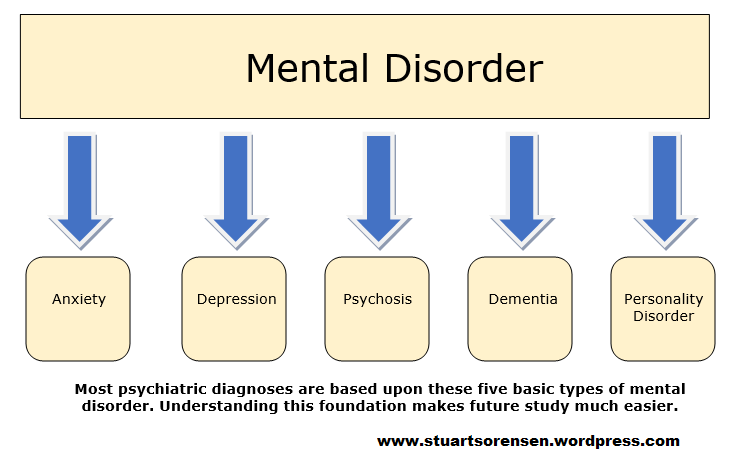 All mental disorders (except the dementias which also include memory and orientation problems) are made up of combinations of these three types of experience or people’s vulnerability to them. Personality disorders are diagnoses based upon the way people usually think and behave and upon their susceptibility to anxiety, depression and psychosis. Remember that those personality disorders that are categorised by anger are really anxiety based. Both anger and anxiety (as we shall see later) are products of the same ‘freeze, flight or fight’ response. The only difference is in the way we think about the situation but in biomedical (physiological) terms the bodily processes are identical. Next Course design 6: Do you want to inform, discuss, develop or what?